I think you are rather pinned in to the design and need to keep the slats vs. ink grooves. Is this exposed to weather (i.e. will it get wet)? If protected you might talk her into alternative materials or if you added more segments (a pain in general), you would eliminate some of the wasted wood. Alternatively you could inquire about making a polygon instead of a circle. I was buying some Jatoba unfinished flooring from “Lumber Liquidators” as it works out to about $5/bf for some wiry nice 3-5” wide strips. I had noticed on their white board a list of excess stock that they were basically dumping. There was two bundles of unfinished teak (about 50 bf) for about $4/bf. It was already taken (sniff…) or I would have snapped that up quick! I believe it is going to spend some time outside, and believe me I spent a lot of time trying to talk her out of teak. The liquidated flooring is a great idea but I unfortunately already picked up the wood. In the future though, 5/8 is typically fine for a lazy susan since they don’t actually have to support anything but ketchup. To avoid the segment at the end I was thinking of putting 1/4 spacers between 2” slats on the glue up. Short in the middle and growing longer at the outside edges. If I calculate correctly I should end up with about 2” of contact all the way around giving the appearance of an out side circle. This will give her the true slats she’s looking for while avoiding the segments end caps all the way around. This may not be helpful but … What about a strip of stainless steel edging to give it a slightly raised lip and band the edges? This occurred to me because I have a tripod for cooking over the firepit outside and it has a band of stainless attached to the round cooking grate. It’s smart in that application because you don’t want food sliding off into the fire. Here you’d have to find a way to attach the metal banding to the boards but I think that’s doable. If stainless isn’t a good color for her, thick copper or even some brass might work. This is a Lazy Susan. Why glue it up with spacers? Run battens across the bottom, and glue the top to those battens with the required spacing. Might be wise to glue & screw it. Attach your bearing to the battens. This occurred to me because I have a tripod for cooking over the firepit outside and it has a band of stainless attached to the round cooking grate. It s smart in that application because you don t want food sliding off into the fire. Here you d have to find a way to attach the metal banding to the boards but I think that s doable. If stainless isn t a good color for her, thick copper or even some brass might work. Interesting idea. It will be worth running it by her. Henry, if I understand you correctly, you are suggesting the individual slats held by cross braces underneath and nothing on the ends? Do I run the risk of those ends warping if there is no side to side support? Check out your local marine supplier. They have pre-cut pieces of teak for boat projects. You might be able to buy a lot of the stuff off the shelf and just do a glue-up. Here is my suggestion. Glue up a 29” square (maybe with the corners cut off). Then on your CNC machine cut the slots using the Profile toolpath – BUT – every so many inches leave the wood solid for about an inch. This would simulate the slots between the strips (but you would still have only one piece of wood). On the ends leave enough solid wood to allow you to cut the outside circular piece. You might want to cut the solid regions of the slots with a 1/4” deep cut to help with the illusion they are individual strips of wood. Jim, this probably isn’t very clear, so give me a call if you want to. Also, 29” is probably too wide for the CNC so you made have to cut two half circles, then join them together. The key point is you never cut the wood completely, so you don’t have to glue individual strips (except for the potential two half circles). Jim, this probably isn t very clear, so give me a call if you want to. The key point is you never cut the wood completely, so you don t have to glue individual strips (except for the potential two half circles). Yeah, that’s way too big for my machine. I only have about 24. I briefly thought about doing halves but got intimidated. But that’s probably not a bad idea. I could even enhance the final assembly with some pocket screws. Maybe this weekend I’ll start to play with the design and will give you a call after I FUBAR it. Here’s a simulated image from Aspire. You would probably have to do this in two sections to fit your machine. I’m not sure how to attach the program, so I’ll send it separately. How about this idea, cut 32 short segments 2 13/16 long and 2 5/16 wide at an angle of 5.625 deg. 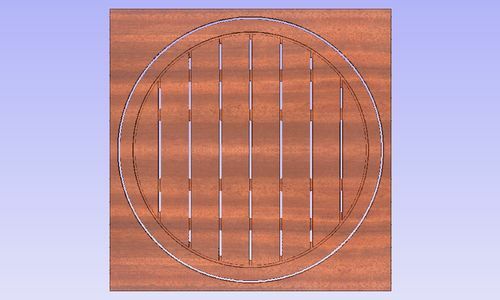 This is going to give you nearly a complete circle 2 inches wide, then use a shop made template and router to trim it to a circle. This has the advantage of utilizing pieces of scrap you rip to 2 5/16 wide. Then rout a dado in the under side of the circle and matching dado’s in the slats to lock in the ends of the slats. Here is a web site to calculate any circle and the corresponding segments you need.